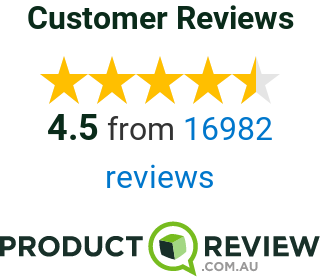 This product will be delivered directly to you from our supplier’s warehouse by a 3rd party courier such as Australia Post or another similar courier type service. 3 – 15 business days – a tracking link will be provided following the shipping of your order. Please note typically you cannot choose a specific day or time for these postal / courier deliveries. If you are not home for a delivery, in most cases the item will be taken to a nearby location for collection similar to other Australia Post and courier deliveries. In some case re-delivery may be possible. Please note items will only be held for approximately 3-5 days and then returned to the supplier if unclaimed. When ordering more than one of the same product, multiple delivery fee’s will apply as many of our products are bulky and heavy and typically we are unable to ship these together for health and safety reasons. Delivery is not available to all postcodes in Australia. To check if this product is available for delivery to your address enter your postcode on the product page or in checkout. This item is not on display in our stores and is not available for Click & Collect. Some products just won't fit in our showrooms, but because we're committed to providing you with the biggest range of furniture at the lowest prices guaranteed, we've added them online! Our online only products are shipped straight yo you from our suppliers. Same great quality at the same great value you've come to expect from Fantastic! The supplier ships your order directly from their warehouse to you!